People often ask teachers, "What are the benefits of meditation?" Researchers are beginning to explore this in a serious fashion. Where meditation was once the sole province of monks, it is now the domain of the public. We all are capable of meditating. We all can benefit from what this practice has to offer us. Simply stated, meditation is not a means of escaping the problems of our personal world and the world beyond. It is a means through which we can find a way to help the world. Learning meditation means discovering a world in which we can help remove the negativity. We replace it with positive thoughts and actions. It's possible, through meditation, to achieve physical, mental, emotional and spiritual changes that enrich us, and all with whom we come into contact. Other goals are possible and even common in meditation. Some practitioners incorporate meditation into their exercise routine. It helps them focus on their tasks. Yoga is one practice that is completely compatible with meditation. It incorporates pranayama – a type of breathing. Proper breathing is necessary in meditation. In fact, correct meditation cannot exist without paying specific concern to the preparatory work. Evoke or invite the spirits, Gods, Buddhas, Bodhisattvas, or other beings – if so inclined or oriented. Arrange your meditation pillow, mat or chair. Sit down with your back straight. This allows the energy to flow freely. Place your legs comfortably. Assume a lotus, half-lotus or legs-crossed position, only if it works for you. Calm your mind through breathing techniques. Only after we accomplish this should we start meditating. Only when we have established a daily practice can we expect to experience any of the benefits of meditation available to us all. It is not easy to bring to fruition all the benefits of meditation. While some, such as a decrease in stress may materialize quickly, others, such as spiritual enlightenment will not. It's critical to realize the importance of establishing a practice. It must be consistent. It must have a goal in mind. It also must have your devotion. 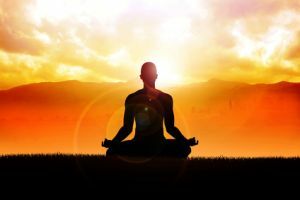 If we do not adhere to the principles of meditation, it will remain forever simply a form of exercise and relaxation. To obtain the complete beneficial effects of meditation, we have to understand that it's a process. As you remove negative states from your mind, your body will automatically learn to follow the mind. The healing power of meditation helps the body to get all the positive energy. Return to Home Page "Spirituality and Health" from "Benefits of Meditation"